Caring and happy. Purposeful and peaceful. Jointly achieving Success. Year 3 have been exploring different types of seed dispersal by creating seeds which can disperse in different ways. Year 3 have been solving problems for Traction Man. We have designed and made machines to help Traction Man to rescue a character from the school drain. We will then make a book about Traction Man's school adventures. Year 3 pupils have been developing their understanding of position and movement in PE. As part of their gym lessons, they have been creating sequences which incorporate different balances. Year 3 have been learning how soils are made. We have learnt to recognise that soils are made from rocks and organic matter. Which would make good farming soil? Which type of soil is our school field? The climbing wall has been such fun - well done everyone ! This term in Year 3, we are focusing on Stone Age and using The Croods to support our writing. We have re-enacted a scene from the film to show our understanding of the characters through our expression and body language. This week Year 3 have been creating their own superheroes; considering the powers, gadgets and character traits which the superheroes have. They worked really hard to be imaginative and come up with their own original ideas. Cherry class have been working together to create pictures of characters from the Wizard Of Oz, surrounding them with phrases they may say. They then used their work to focus more on using speech punctuation correctly. After a very busy week of making moving pictures, comic books and Egyptian pastries, year three pupils invited their families in to celebrate their learning. Year three have been busy using animation to inspire writing. They have worked hard developing comic books linked to Egyptian mythology. As part of our PE lessons Year 3 are learning country dancing. In Pear class we find some of the steps a bit tricky but we are enjoying learning them. Year 3 have been busy practising their control of throwing and catching ready for team games next week. Playing a range of quick games, pupils were able to set their own challenge to make them harder or easier to gain better success. We have been reading the Iron Man in Year 3. Pear class have been inspired to do some home learning and have made models of Iron Man. One model was made out of Lego, the other was made from an old lamp shade and other bits and bobs from his recycling box. Well done boys! Year 3 have been busy creating digital images showing the Space-bat-angel-dragon coming to earth in the book 'The Iron Man' by Ted Hughes. Sentences were then generated from the images with talk used for writing recounts. Year three are currently reading The Iron Man by Ted Hughes. They took on the role of people in the story and through role play had a debate to whether the iron man should be caught or not. Year 3 enjoyed a workshop today about the importance of being bright and seen in the dark winter months. They wrote some wonderful songs and made some super posters! We have been inspired by our Power of Reading book Krindlekrax by Philip Ridley and have made lizards. These lizards are also going to feature as the main character in our narrative writing. The lizards were tricky to make but we are proud of the end results. Year 3 have been celebrating gaining their first badge for walking to school. Thanks to all the parents for supporting this. Year 3 have been thinking about our local area as part of our topic. This week we looked at who uses the roads near school and converted the information in a traffic survey into a bar chart to help us analyse the data. Year 3 have had a great first day. We have been learning about how to mix paints and about primary and secondary colours. As part of the Celebration and Aspiration day, year 3 undertook training with gold medal winners Jason Gardener and Ryan Scott, they had such fun! As part of their class topic, year 3 had a fabulous trip to Cadbury World in Birmingham last Friday. Click on one of the photos below to start the slideshow. Look at the colourful Iron Man inspired pictures the children made today! This morning we were visited by Mrs Hopes. She came to our classroom because in topic we have been learning about different countries. We made a questionnaire to find out about what she has done in different countries and to give us information to help our topic. We asked her 26 questions. We found out that you can go on to a plane and then onto a boat, we think that that is really surprising because if your plane lands on the water it floats! Mrs Hopes also told us that she went on aeroplanes to go to lots of places such as New York, Thailand and Hawaii. We were really surprised when she told us that her daughter had a leech stuck to her in the rainforest and also that she got a certificate for it! This was in the rainforest in Borneo. We learnt that in Devon there is an island called Lundy Island. There are no televisions or internet and it was very dark when they turned the electricity off. From our group, Jaida said she would like to go because it would be fun to have some quiet time with your family and that you could chat for a long time and play board games. Sam and Jan said they’d like to go and explore because they liked adventures. Karun would also like to go to relax although it might be difficult not having a tv or phone and he may get bored. In Borneo Mrs Hopes sat in a big, black tyre and went down a river. She was looking in the air and saw monkeys climbing in the trees as she went down-stream. This sounds like a quite good view of monkeys. Jaida would love to go down the stream because it would be cool to go down the stream looking at monkeys and other animals and listening to sweet birds singing. It reminded Jan of Bob Marley’s ‘3 Little Birds!’ Jan didn’t realised how long it took to get to Hawaii, he’d love to go! Jaida mentioned Mrs Hopes wanting to go to Iceland and see the stars and the sky at night and that this would be a lovely night. In topic we have learnt about Australia, Brazil, the Arctic and China. We really liked Mrs Hopes’s stories and looking at her pictures. Jan was surprised with how big her albums were. Sam liked the mini-elephant because she got it from Thailand and it looked really good because it had a saddle! Most of the interesting things were her souvenirs which she bought in different countries, they were beautiful! Karun especially likes the shells from Thailand. We enjoyed liked listening to her and looking at her things, we have learnt a lot from Mrs Hope for our topic. Complete with hard hats, boots and gloves the whole school school visited our new school with great excitement! Year 3 have been making 3D shapes from different medium. This week the Year 3 classrooms have spun around and landed in China! We used images of plum blossoms to help inspire us the create these images. We used paint, straws and our fingers! Thank you to all the parents carers and grandparents who came in to year 3 to share their Egyptian experiences.Everyone loved the Egyptian pastries- could you tell what the ingredients were? As part of Safer Internet Day, year three discussed why we take photographs and how they are used. We focused on posting photos online and how they can contain information/clues about us, some of which we might not want strangers to know about. We looked at some photos, sharing our initial thoughts and responses, discussing how they can be used in both a positive and negative way. Following class and group discussions, we thought of questions we could ask someone if they said they were going to put a photo online and created posters sharing these. Year 3 have been busy investigating word classification as part of our Grammar lessons. Year 3 have been blending colours while painting to create a sunset effect. They then added detail to develop their work to showing an Egyptian sunset. Year 3 are enjoying their new class text 'The Egyptian Cinderella'. We have been hot seating the characters to find out more about them and the themes of the story. Year 3 have been doing lots of work on word classification and looking at how we can change the order of words in a sentence to change meaning and emphasis. As part of their topic, year 3 visited Bristol Museum and Art Gallery today. They had a great time handling and learning about artefacts from the Stone Age. National Book Week- what's your favourite book? Year 3 took part in our first Intra-house sports competition on Monday. We played football and then presented our results in bar-graphs. Year 3 have been busy this week creating lizard monsters for some story telling work we will be doing later this week. We have learnt to pin and sew fabric using running stitch. Following on from our learning walk last week, we have been looking at real maps to find out many of the different symbols that are used. We had to look carefully at the key and copy each symbol onto our sheet. In PSHE we have been working together to solve problems. Here we took on the role of a farmer having to cross a river with a fox, a chicken and some corn. It was tricky to solve the puzzle but by working together we did it! As part of our topic looking at our local area, Year 3 have been conducting Traffic Surveys on Lodgecauseway. We went out in small groups throughout the morning to look at who was using the roads. After lunch we shared our findings and examined when the road was busiest and considered why this might be. We’ve learnt about ‘Rush Hour’ and looked at different traffic calming methods that are used by some roads. Some of the Year 3 children have been busy gardening. They’ve been planting seeds and making sure all our plants are watered. Year 3 have been lucky enough to observe the transformation from caterpillar to butterfly. First we watched as our tiny caterpillars ate their food and grew to more than ten times their original size. Next we saw them crawl to the top of the pots and hang upside down and shed their skin to form chrysalides. Finally, we saw them emerge as beautiful painted lady butterflies, completing their metamorphosis. We then had a few days to watch them grow in strength and then as a class we released them into nature. Year 3 were lucky enough to have a workshop with Go Sketch this week. We learned lots of techniques and had a go at using different media. Not sure what’s going on in the photos? Ask us! Year 3 enjoyed making grass heads at the end of term. We wonder how they will grow at home? Do email in your pictures for the website so we can see how much they’ve grown! Thinking of those less fortunate than themselves was at the forefront of the childrens' minds as each and every Year 3 child completed a mile for Sport Relief on Friday. They were just amazing! Year 3 chose the tragedy "Romeo and Juliet" as their World Book Day play. Here they are skillfully narrating a contemporary screenplay. Year 3 loved their book quiz for World Book Day. Look how well they are listening. We have been looking at the role of the bystander in scenarios where children are being left out, or in extreme cases, where they are bullied. We talked about what we could do and acted out some of the scenes to show what we would do. As part of our ‘How Does Your Garden Grow’ topic, we have been out in the playground examining plants and looking at their leaves. We had to sketch detailed observational drawings in our sketch books and label them with the words we had learnt in class (lobes, tip, veins). We have been looking at division in our mathematics lessons. Here we are explaining the difference between grouping and sharing to each other. Year 3 end of term Inter-House dance competition. As part of their Tombs and Temples project, within literacy, Year 3 have been recreating "Egyptian Cinderella"
Year 3 created a Powerpoint presentation to explain their PE lesson to the rest of the school in assembly. Click on the link below to see their final dance. This term in PE our focus is dance. **We have started to follow a Hip Hop dance teacher. *We are learning new Hip Hop dance moves. *We will then work together in small groups to choreograph a Hip Hop dance routine. *We will then have a dance off at the end of term. Year 3 have been doing lots of work towards supporting this year’s anti-bullying campaign. We have looked at what we can do if we feel we are being bullied and also the role of the bystander. We have made hand shaped posters to promote awareness and here are some photos of us acting out what we could do if we saw someone being bullied. Year 3 have been looking at persuasion in English this term. Here we are learning how to hold a formal debate! What would you vote? Can you spot any of our persuasive devices? We have been investigating whether different magnets have different strengths. To investigate this, we worked out how many paper clips each magnet could hold. We had to think about how we could make this a fair test by keeping some things the same and changing others. We have been very lucky to have someone from Majestic Gymnastics who has been coming in each week. She has been teaching us the skills needed to do a cart wheel and a hand stand. We have used apparatus and floor mats and have been moving around the hall in a variety of ways, symmetrical, crouched, wide, tall etc. It was lovely to see so many parents and carers join us at the end of term to see what we had been up to in Challenge Week. During our Challenge week we enjoyed making and tasting Pottage and bread rolls. We also were very creative and used clay to create bone and stone jewellery. To celebrate everything we had learned during our ‘The Real Flintstones’ topic we invited parents and carers in to see what we have been doing. 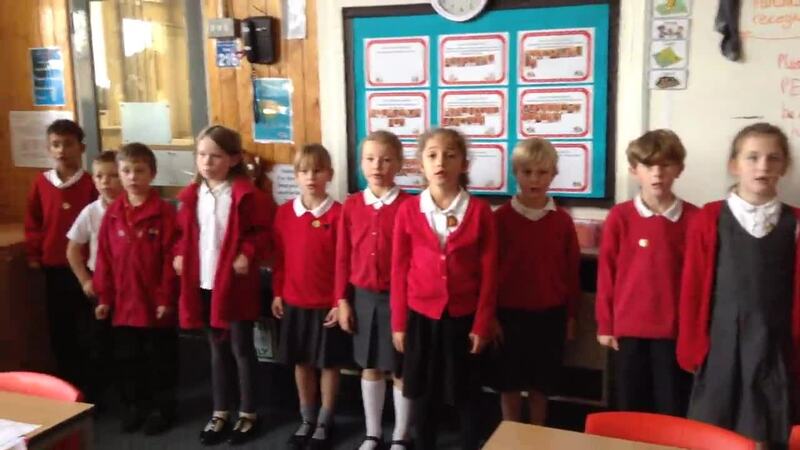 Year 3 worked hard on their listening and speaking skills on No pens Wednesday! Here are some pictures of what we got up to. Ordering and comparing numbers in Maths, singing and improving our skills in hockey and gymnastics. Year 3 enjoyed their Bike It training today- look at them skillfully riding between the cones! Here are pictures of the year 3 School council elections. We had several candidates who worked hard on their very impressive election speeches. As part of our topic ‘Oceans and Seas’, Year 3 have been learning how to mix colours to show different effects. We experimented using different shades of blue and then created seascapes. These girls proudly showed off their Judo skills in assembly. On Friday, Ian from Sustrans led a smoothie workshop for Year 3. Everyone peddled as hard as they could to prepare a deliciously healthy fruit drink! Mr. Phillips and some of the Year 6 children came to the Year 3’s how to play Kings Square. Year 3 explain how water is transported in flowers and plants. Click Here to see the children explain how water is transported. Year 3 have been reading all about the adventures of Traction Man. We took photos of Traction Man solving problems all over the school and have put them into our own stories. Year 3 enjoyed making grass heads at the end of term. We wonder how they are growing at home? Do email in your pictures for the website so we can see how much they’ve grown! 3E received gymnastics tuition provided by Majestic Gymnastics. The year 3 children concentrated on floor activities. Look at the effort the year 3 children put into their inter sport tournament! Harry Potter Night at Chester Park Junior School, a magical night for the adults and children! Year 3 have been developing our acting skills by exploring alternative endings to The Egyptian Cinderella. We used freeze-framing to create tableaus and had to say what we were thinking as the character at that moment. In year 3 this term we have been focusing on working together in teams. We have developed team games using specific equipment and we have learnt to develop a street dance routine. Which then resulted in a ‘Got To Dance’ Style competition, where each team preformed and supported each other. As part of our Topic The Real Flintstones we have dramatized the day in the life of a family who lived during the Stone Age. Wednesday 15th October was No Pens Wednesday. Year 3 had a great day putting down their pens and using their speaking, listening and ICT skills. In Topic we have been considering how we are connected to others locally and globally. We focused on a specific Fairtrade product (Cocoa Beans). Pupils were given one profile each and asked to read their profile and think carefully about their role – these varied from producer roles, to production line roles to consumer roles. We were then given time to reflect on the number of people involved in the process. One person was then handed a ball of string and asked to hold one end, they then needed to find someone they felt connected to and walk across the circle and give that person the ball of string and then return to their own place; e.g. started with ‘A check out till operator’ … who feels they are related to ‘A café owner’ … who feels they are connected to … ‘A market stall trader’ … who feels they are related to … etc. We continued until everyone was connected, maybe more than once, and formed a complex web. This highlighted the local connections and the global connections. During our English lessons we have been putting ourselves in the role of the characters from Charlie and the Chocolate Factory. We watched a video clip showing the section when a worker found the golden ticket and had to hand it over to Veruca Salt. We then worked in groups to decide what we would look like, feel and say if we were that person. Here are some of our thoughts and feelings. This term in Year 3 we have been reading Charlie and the Chocolate Factory as part of our Chocolate topic. We have been using adjectives and similes in our writing when describing the characters. We then started to think about writing newspaper reports using amazing language to keep the reader interested. Jordan visited Year 3 to help develop our understanding of signs and symbols linked to RE. We were able to look at clothing, art work and other important objects which show religious symbols and signs. Children were able to discuss and share thoughts and feelings based on their own faiths. We have been looking at Myths and Legends and have already written our own mythical stories. We then listened to a Myth by Ted Hughes and then used drama to recreate that Myth, thinking carefully about freeze framing and how characters would have been feeling at certain points in the story. As part of our Oceans and Seas Topic we have been learning about the different ecosystems, in particular we have used our aquatic ecosystem to discuss and observe familiar ecosystems. We have taken pond water samples to identify life within a drop of pond water. We have observed how things are living together and how they are supporting each other. This term, as part of a sequence of PE lessons, Year 3 have been studying interpretive dance. They have combined their musical knowledge of rhythm and beat to create a varied, reactive movement piece to The Circle of Life. They have worked hard in small groups to practice, perform and evaluate their performances, choosing different roles within the groups! click here to see the year 3 dancing! Year 3 have enjoyed exploring the use of e-mail in ICT and understanding it’s importance in everyday life! 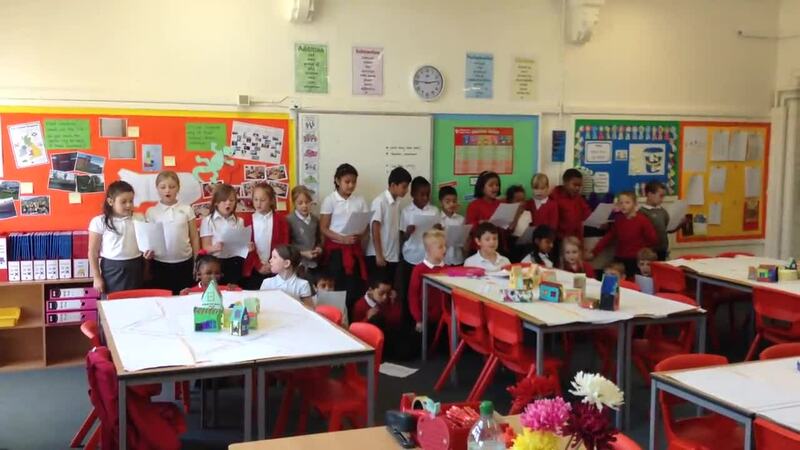 As part of challenge week, year 3 have been working towards a filmed rainforest presentation! For the presentation, they have: written a rainforest report, created a documentary-style script, made and painted papier mache animals, designed rainforest backdrops and produced monsoon collages! They are now looking forward to filming and editing their documentary-style presentations and showing them to the rest of the class! Year 3 children thoroughly enjoyed all the events Sport Relief Day brought. Look at how much care and effort Bhumi and Katrina took creating their own rainforest houses at home! This week we have been experimenting with creating different shades of green. In order to create a colour spectrum, we started with a base shade of green and then added varying amounts of white and black in order to create lighter and darker shades. We then used this skill when painting different rainforests scenes! © 2019 Chester Park Junior School.